Short weekend excursions from Hanoi like Phu Vinh are always a refreshing experience giving balance to the daily grind of traffic and racing here and there. When you come to Hanoi, slow down. OK...do the museum/temple/ mausoleum sprint...but then sit back. 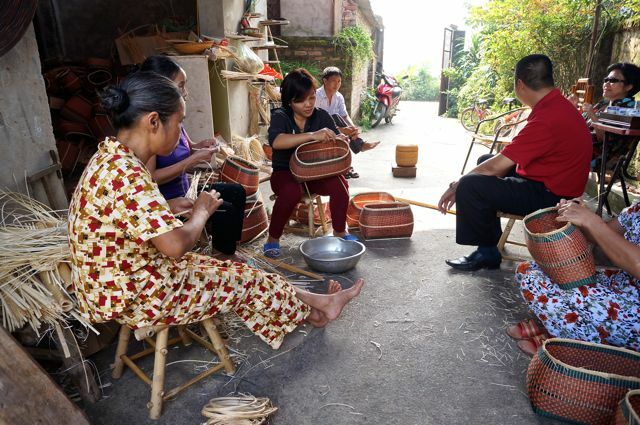 Take a day or two to go out to the small villages to get a sense of history and tradition and check out the skilled artisans whose ancestors have plied their crafts sometimes for a thousand years. 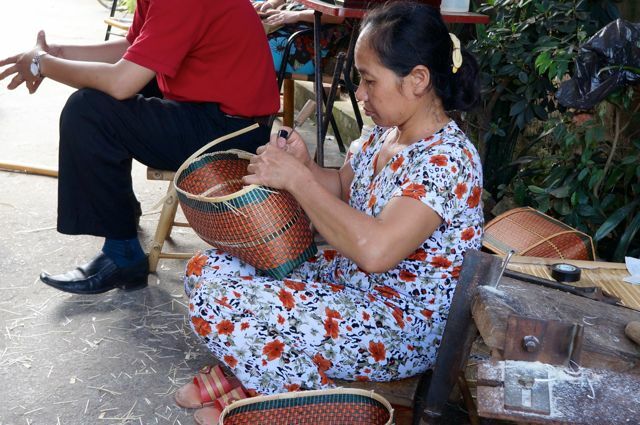 There are several craft villages near Hanoi but Phu Vinh is one of the lesser known stars. It is about 27 kilometres from the on Road 6 through farming country and rice paddies and small bustling villages. Along the way is the wonderfully presented Ho Chi Minh Trail Museum which in its peaceful setting gives a chance to really understand the tremendous determination and fortitude of the Vietnamese spirit. 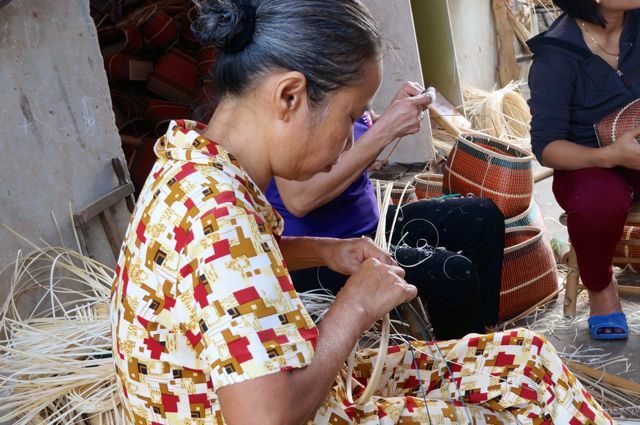 From the highway, the turn to Phu Vinh took us about 2 kilometres plus a further 200 meters up a lane to the entrance to the home/factory of Phu Vinh's top basket weaving craft Teacher, Designer and Trainer, Mr. Hac. ​We walked into the garden and immediately found a circle of 4 women varying in age but not size, their hands flying with a one stage in the building of a bamboo woven basket. No machines here and no crowded factory. Just the 4 of them in a circle chatting and smiling and giving us grins of welcome as we wandered in. Mr. Hac’s 70 year old house and garden is a tranquil backdrop, seeming to push tradition and history into the bamboo craft pieces he and his friends produce. Mr. Hac eagerly showed us his designs and each of the designs we picked up had its own story, provenance of materials and design, and intricacy of its pattern. Some included tales of his father and grandfather and famous design achievements. After looking at a few interesting pieces, we went out to sit with the women and watch them do their bamboo cutting, shaping and hand weaving. Meanwhile, Mr. Hac saw how keen our interest was in the design so he got out a book show casing the unique designs of various bamboo crafters in Vietnam. It was a coffee table book which included two of his designs and to my surprise, he gave me one copy of the two he had, as a souvenir. Mr. Hac is third generation in a family of fine bamboo designer- crafters. His grandfather, born in 1888 joined the craft tradition in the village and he showed us one of his grand father’s master pieces that Mr. Hac was able to preserve. His father picked it up the skills at his father’s feet and eventually the enterprise was passed on to Mr. Hac. 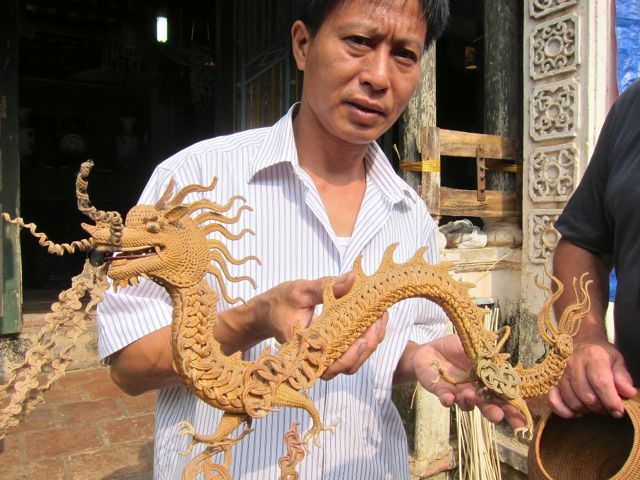 Here is his grandfather’s masterpiece, a dragon finely crafted from bamboo. 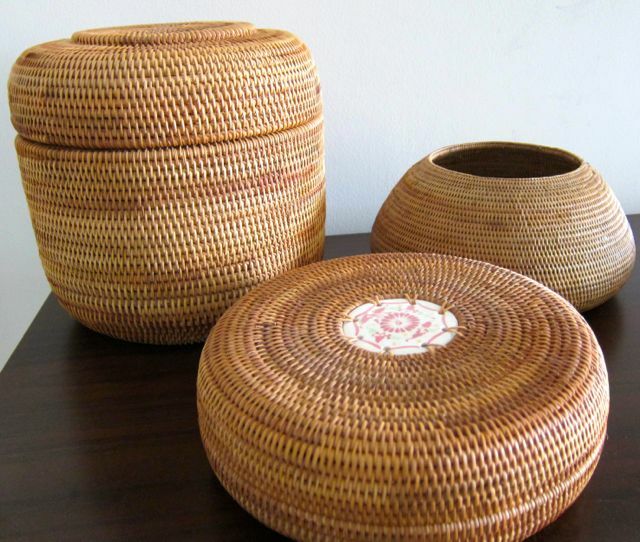 Phu Vinh is now the top village for bamboo and rattan craft. About 85% of its residents are engaged in the craft. In fact, because of this, the village has reduced its poverty levels down to 5.34%, well below the regional average for rural areas. ​In this village live not just the greatest number, but the finest of the country’s bamboo craft artisans. In fact, as early as 1712, 8 artisans from this place were awarded by the King the title, “Masters of the Traditional Handicraft”. Phu Vinh at one point had a change in name. It used to be called Phu Hoa Trang. Phu means good fortune, so the provincial chief who made the change carried Phu in the new name but changed Hoa which means flower into Vinh. Vinh means glory and speaks more of lasting fame. And as the world passes by, it is discovering the beauty of the baskets and purses, the glory of this village. 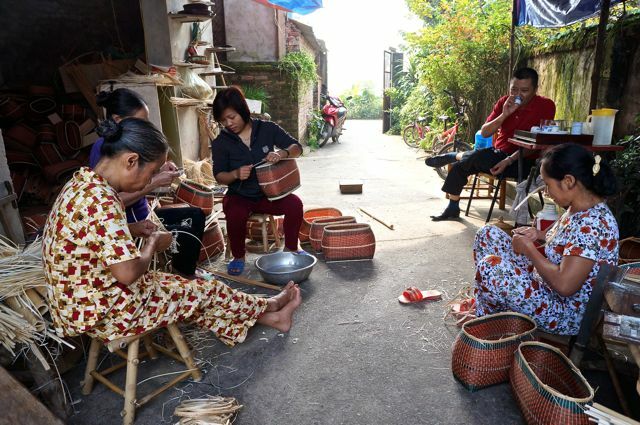 Making bamboo handicraft in a circle with friends is very much a social event for the villagers. They sit in circles on their little stools in open spaces, often the walkway to the house just outside of the storage area, for easy access to materials and as they work. They share with each other, have a good laugh, maybe sometimes, a sniffle but always feeling part of a community. Friends drop in. Tea is shared.